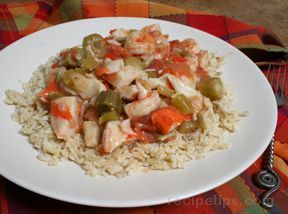 This spicy and hearty seafood gumbo is filled with shrimp and clams. 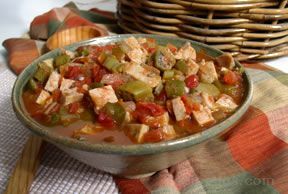 Celery and onion add great flavor to this gumbo you are sure to enjoy. Combine soups, tomatoes, chicken broth, Tabasco and clams to slow cooker. Add more chicken broth if desired. Saute celery and onions in vegetable oil until tender. Add shrimp and saute 3 minutes until pink. Drain from oil. Add shrimp mixture to slow-cooker. Cook on high for 2 hours. You may cut shrimp into smaller pieces before adding to liquids, if desired. 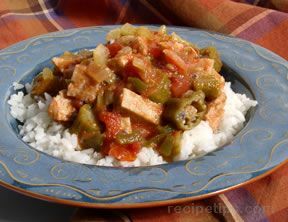 VARIATION: Instead of slow cooker or crock pot, cook in a large pot on stove top. Bring to boil, simmer 30 minutes.